It's time to make my Q1 Finish Along list. We have a wonderful new host for 2015, Adrianne who blogs at On the Windy Side. Adrianne is a talented quilter and a lovely internet friend of mine. I am looking forward to finishing along with her this year. For Q1 of this year, I am linking up only 3 projects, one per month. After a couple of FAL quarters where I barely finished anything on my very long lists, I think this might be my best strategy. So my first item is to finish the small guitar case with those colourful strips. 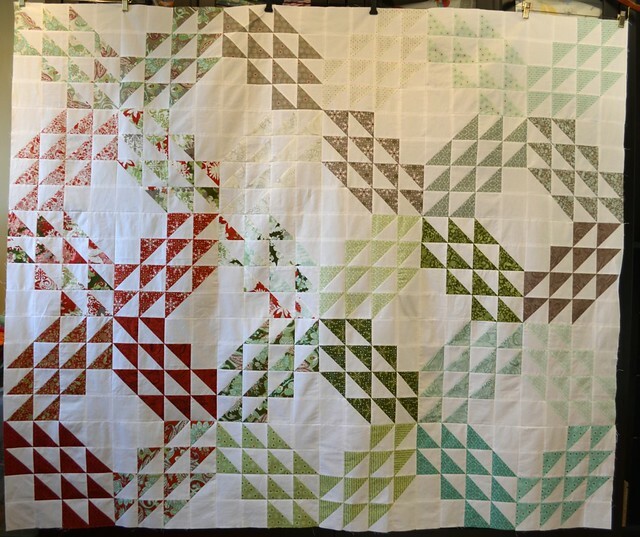 This quilt top from my pattern named Consider is next. It actually has a border, different from all in this photo but has been stalled since then. 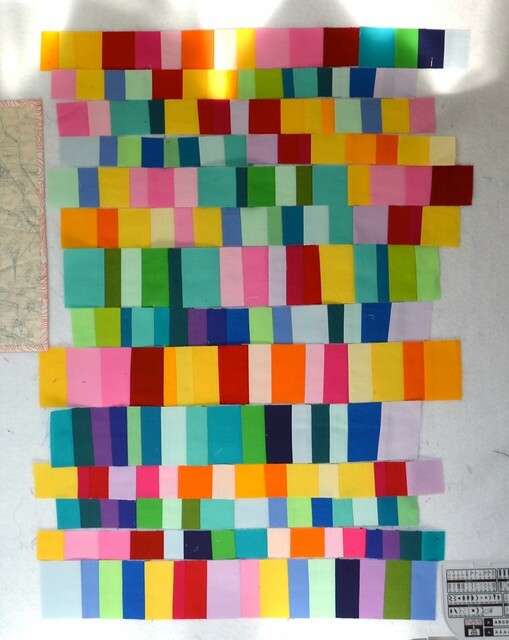 Last, I want to finish this winter Ocean Waves quilt. I have the top and the back done, all I need it to get batting and quilt and bind it. I thought about just 3 as well but so far I'm at 7, lol. Good luck! You'll do this easily Leanne! Looks great. The ocean waves is beautiful! Very manageable list. Here's hoping the new tactic encourages the better finish rate you are after. oooh sensible having only three !! that way you can do other things too without feeling guilty !!! Great list Leanne - I love that colourful improv. project. Good luck! Great list! 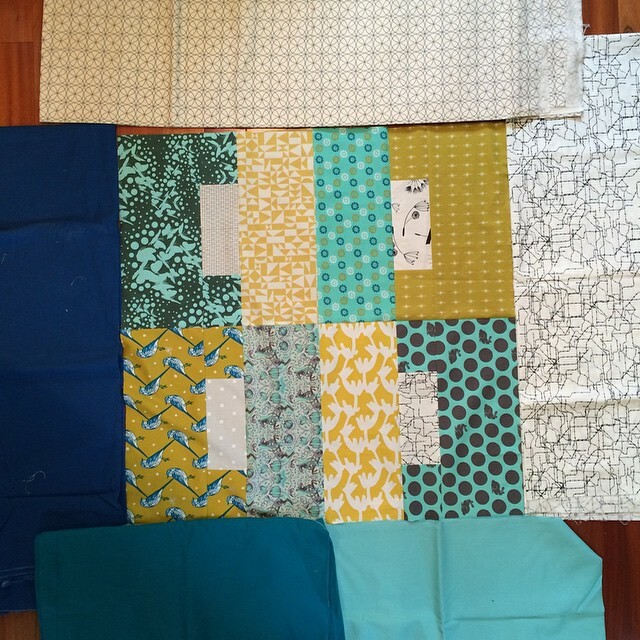 I especially love your ocean waves quilt and am excited to see how that progresses! I've never done this before. Do you have to have a blog to participate? Or do we paste our photos into a comment section like this and report out at the end of the quarter? What a great idea - it is all about accountability! I love the colourful strips! I make myself finish each project as I go because I have so little time, but as the years roll on I may have some UFOs tucked away. This looks like a doable list. I shall sit back and wait for you to wow me. My fav is the first one! Must be all those colourful scraps! Great list! I just quilted an Ocean Waves quilt - those are beautiful! I love that you've chosen 3 very different projects and I can't wait to see them finished. Good luck with your finishes Leanne. All very nice projects. I especially like the first one. I joined up for the first time and am hoping it will spur me to finish a few things.